Another combined challenge card today, my friends. 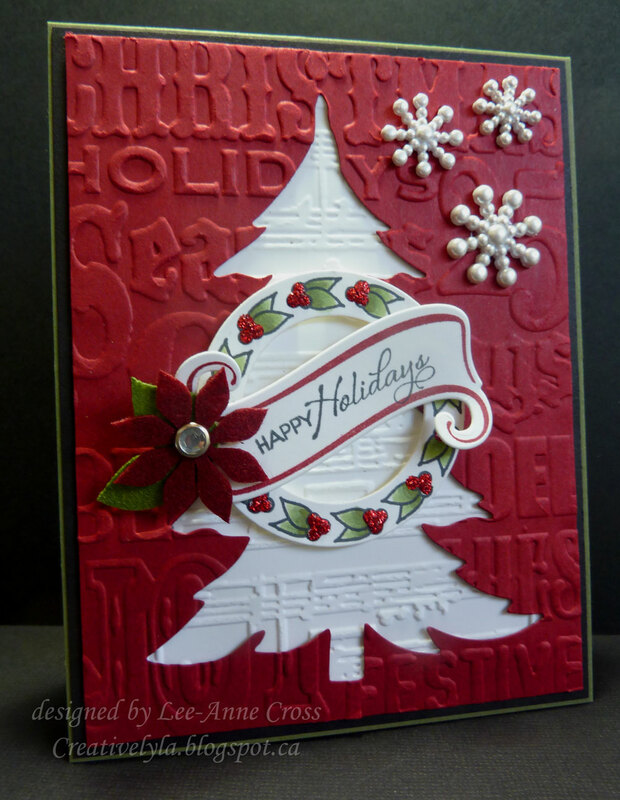 Dina has asked us to make a card based on a show tune/musical…I chose White Christmas. And, Dawn has asked us to use a negative from a die cut. The red layer and the white layer have been dry embossed with a Christmas folder and a music folder, respectively. Next I stamped the Verve wreath in Memento Tuxedo Black and colored the holly leaves with Copics. Then I added the berries with Stickles. The Verve scroll die was stamped in Cherry Cobbler, and then the sentiment was stamped in Memento Tuxedo Black. I’ve popped up the wreath and the scroll on dimensionals and then added the little poinsettia with a rhinestone center. For a little more bling…I’ve added some pearl white snowflakes. Back soon with more…have a beautiful day!!! Oh how pretty! Such beautiful textures and details!